In a bowl, mix the cream cheese, chives, and garlic. Divide the mixture into 4 balls. 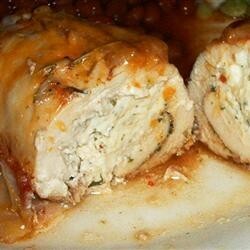 Place 1 cream cheese ball in the center of each butterflied chicken breast half. Fold the chicken over the cream cheese, wrap with a slice of turkey bacon, and secure with toothpicks. Arrange the chicken in a baking dish. Pour the butter over the chicken. Bake 30 minutes in the preheated oven, or until the bacon is crisp and the chicken is no longer pink and juices run clear.